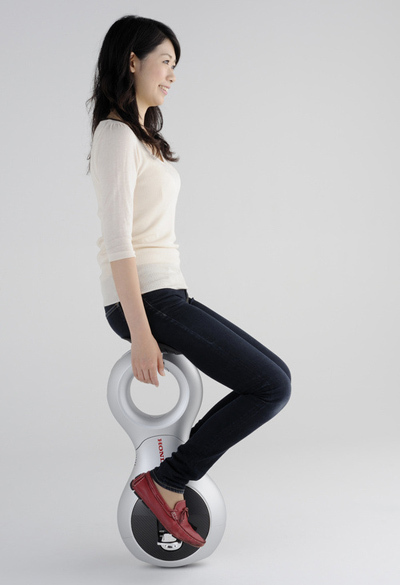 The UX-3 is an absurdly bizarre contraption which Honda has devised in order to evaluate a completely new form of transport. The UX-3 is an experimental technology at the moment, but Honda intends to continue research and development of the vehicle, including testing in real-world situations, to confirm the practicality of the technology. Despite the fact the Honda UX-3 makes the driver look like a complete idiot, it does feature some pretty impressive technology within its sleek bodywork. Namely Honda's omni-directional driving wheel system (HOT Drive System) which enables movement in all directions, including right and left and diagonal, thanks to many small, motor-controlled wheels that are connected in-line to form one large-diameter wheel. By moving the large-diameter wheel, the device moves forward and backward, and by moving the small-diameter wheels, the device moves side-to-side. Combining these movements allows the UX-3 to travel diagonally too. 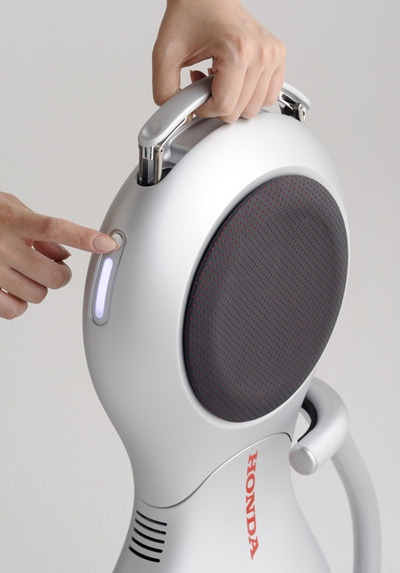 The design of the Honda U3-X has been developed to help the user interact with people around them. Unlike many other forms of personal transport the UX-3 places the rider at roughly the same eye level as pedestrians. 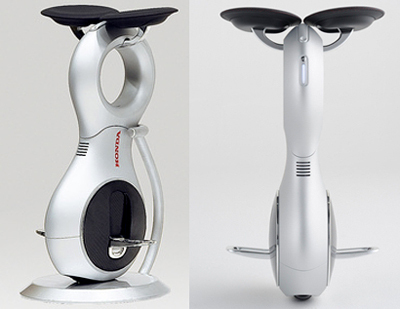 So instead of looking down on them from a Segway, or up at them from a Toyota i-Real, they can talk face-to-face. 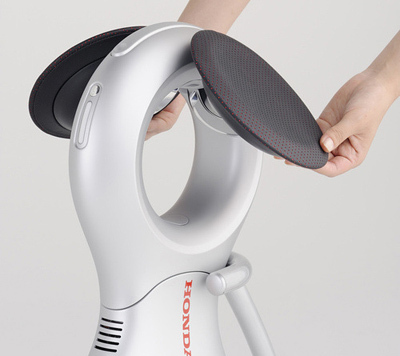 The system which balances the Honda UX-3 is derived from the balance unit found in Honda's ASIMO robot. 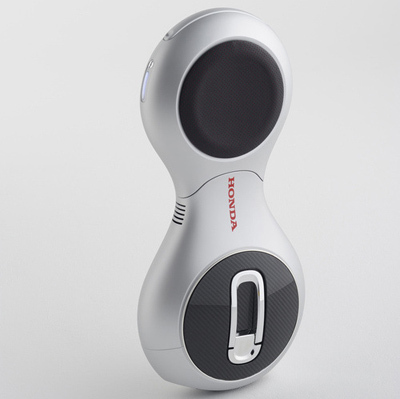 Honda's balance control technology enables ASIMO to stand, walk and run in a controlled manner. This technology has been developed for the U3-X  to detect a shift in the rider's bodyweight to adjust the direction and speed of the device. Based on the incline sensor data, precise control is applied to return the device to an upright position, which achieves smooth and agile movements and simple operation using weight shift only. The Honda U3-X has a lightweight monocoque body, with the foldable seat, footrests and body cover housed within the body of the device, making it highly compact, portable and convenient. 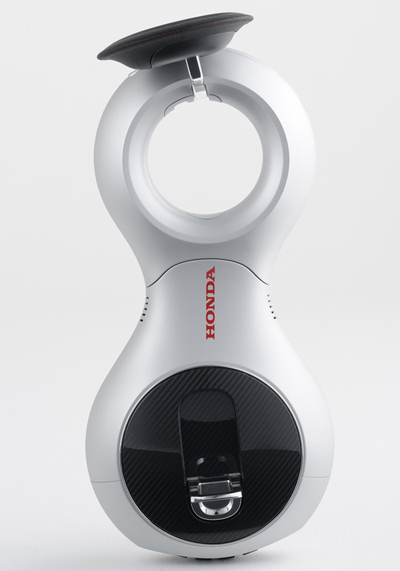 Weighing in at less than 10 kgs (22 lbs) the Honda UX-3 features a lithium ion battery which offers up to 1 hour of operation with a full charge.